Creating Our Home: Celebrating & Savoring a simple Christmas Winner!! 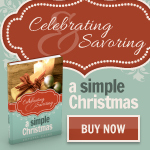 Celebrating & Savoring a simple Christmas Winner!! Congratulations! Please email me at amkrewald@att.net and I will get you the information on how to redeem your prize! If you didn't win, you still have time to get Crystal's book for $.99. This special is good through Thursday!